Squid ink pasta with Maryland crab, calamari, ramps and Calabrian chilies at Alta Strada in Washington, D.C.
What would you do if you took possession of a restaurant and found 60 pounds of frozen squid in the walk-in? For chef and restaurateur Kenny Gilbert, who likes to do things “a little different,” the answer wasn’t baskets of fried calamari with marinara sauce, but rather a ramen bowl with udon-style noodles made of puréed squid. “In America, we’ve resorted to doing things the masses are going to eat,” Gilbert said. Next week, Gilbert will debut his squid “pasta” dish at the new Gilbert’s Southern Kitchen & Bar in Jacksonville Beach, Fla., one of four concepts he operates in the area. To make the noodles, Gilbert purées squid with egg whites and flour to make a paste and pipes it into water. He plans to serve the noodles, which he described as having the flavor of dumplings or spaetzle, in a bowl with a smoky tomato broth, garnished with radishes, kale, crispy brussels sprouts and benne seeds. “It’s a fun spin on a something kind of classic,” he said. Gilbert is one of a number of chefs forgoing fried calamari in favor of alternative, but still approachable, preparations. At Alta Strada in Washington, D.C., Adler serves squid ink casarecce, a housemade squid-ink pasta with Maryland crab, calamari, ramps and Calabrian chilies, inspired by a similar pasta dish he had while visiting a small town on Italy’s Amalfi Coast last year. Grilled squid adds another layer to this Albacore tuna dish with Vadouvan vinaigrette at Red Star Tavern in Portland, Ore. In Chicago, Oyster Bah has recently introduced grilled calamari with arugula, mighty vine tomato and garlic. "It's a nice opportunity for guests who want to enjoy calamari, but something lighter than the typical fried dish they may be used to,” said Oyster Bah executive chef Donny Farrell. “Now that there is more availability of fresh product, chefs no longer have to always fry it, rather allow the freshness of the calamari to shine." 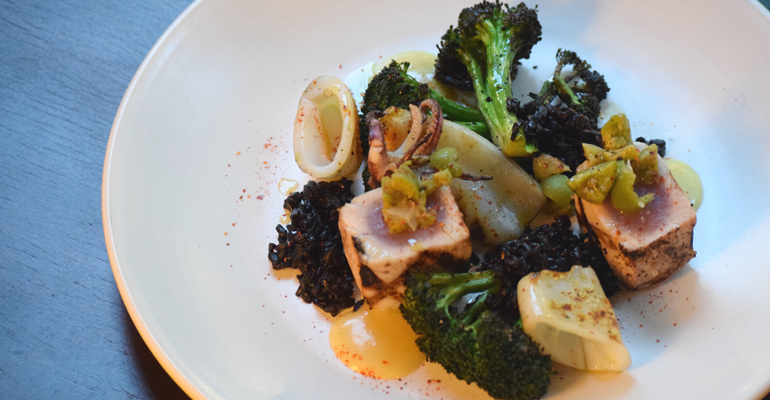 As part of his seasonal, three-course menu in March, chef Dolan Lane of Red Star Tavern in Portland, Ore., is serving grilled Pacific albacore tuna with marinated olives, black rice spiked with squid ink, grilled calamari, charred broccoli and vadouvan vinaigrette. At the soon-to-open Lupo Marino in Washington, D.C. fried calamari is made approachable and portable via paper cones. While he serves grilled squid, Lane is a big fan of fried calamari. 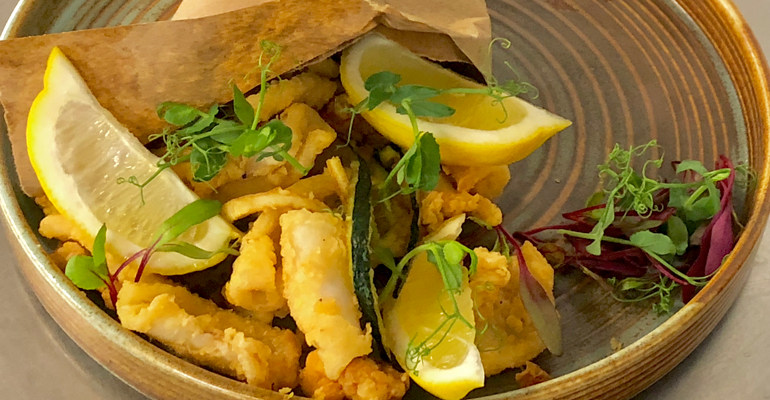 Corporate chef Matteo Venini is also a fan of fried calamari, and fried seafood in general, which will be the focus of the menu at Lupo Marino when it opens in April at The Wharf development in the Southwest Waterfront of Washington, D.C. The Italian street-food concept will serve a variety of fried seafood dishes, including paper cones filled with fried calamari mixed with other fried foods, such as shrimp and potato chips. “Serving [fried calamari] in a folded cone makes it easy to transport while taking in the sights,” Venini said.